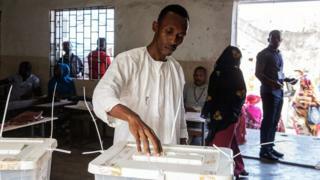 Presidential elections are taking place in the Comoros Islands for the first time since a referendum to increase term limits. Previously the presidency was rotated around the three Indian Ocean Islands every five years – a system which was put in place to stop constant coups. Thanks to the referendum outcome, President Azali Assoumani is able to run for re-election. He is running against 12 opponents but is widely expected to win. The Supreme Court barred some of Mr Azali’s rivals including the former President Ahmed Abdallah Sambi, who is accused of corruption. The opposition have reported irregularities in Sunday’s vote. A dozen polling stations have been ransacked on the Anjouan island, an official from the electoral commission told AFP news agency. Witnesses told AFP that the polling stations were attacked after people found filled ballot boxes. Last year there were violent protests when the referendum put an end to the system of rotating power every five years among the archipelago’s three main islands. The arrangement had been put in place to promote stability in a country that has had more than 20 coup attempts since its independence in 1975. Now presidents can run for two terms. If there is no clear winner, a run-off election will be held on 21 April.